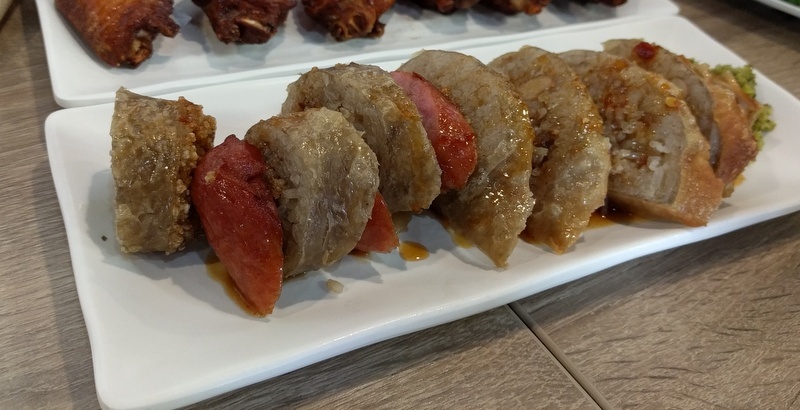 This is a popular dish at food stands in Taiwan. It’s also known as small sausage in large sausage. I’ve had this before at night market, and it’s a fun treat. I love the way it’s char-grilled and so juicy. I recently had this in a more polite, use-your-forks way (see picture above). For some reason, I didn’t enjoy it as much the second time around. Perhaps it’s because you can’t really pick up the sticky rice portion. Or maybe the ratio of sausage and rice gets altered. Anyway, if you’re a fan of sticky rice in dim sum restaurants, the Taiwanese hot dog (at least at authentic night markets) can’t be beat. I like sticky rice a lot, and yet, I never cook it. I knew a Malaysian Chinese woman who made whole de-boned chicken stuffed with sticky rice and lots of other things. Yum! There are lots of things I like and yet never cook. Oysters is one of them. It makes eating them in a restaurant (or on the street) all the better. We used to do turkey with sticky rice as a Thanksgiving tradition. Unfortunately, I’m not as skilled as my mom! I don’t cook oysters either, and my husband just loves eating the oyster omelets that are famous in Taiwan. Sticky rice is the best. Unfortunately the rest of the family is on a brown rice kick. It’s hard to do sticky rice using brown rice. :( I have had jasmine brown rice, though, and it’s pretty tasty.